For two decades Minneapolis has been cutting back on street maintenance to the point that hundreds of roads are now in critical condition. Especially over the last decade, as it has absorbed $297 million in local government aid cuts from the state, the city has been forced to choose, essentially, between funding police or streets. And so, the streets have steadily deteriorated, their budget increases lagging those of other departments by roughly 20 percent. It’s really pretty simple, as Kotke explained it. Like any maintenance issue, you can patch up the problems for only so long before the underlying structure begins to fail. The city spends about $7.5 million a year from its general fund on street maintenance, Kotke said, but needs to spend triple that amount just to keep streets in their current deplorable state. It would take four or five times that amount — at least $30 million a year — to make actual improvement, he said. That’s because filling potholes and doing patchwork is relatively inexpensive, but rebuilding a street from the bottom up is extremely costly. That’s what needs to happen here in a lot of older American cities, he said. Last week, in response to complaints, the City Council found an extra $1 million in a rainy-day fund and earmarked it for extra pothole-filling crews. But again, patching isn’t the long-term solution. The freeze-thaw cycle will create another urban moonscape next spring, and the next. With the Republican-led Legislature plotting yet another raid on the city budget, Minneapolis (and St. Paul, too, which has its own impressive collection of street craters) seems have only two options remaining: Pray for a permanent end to winter, or go back to gravel. $30 million per year spread over 380,000 people is $78 per year per resident, which is $0.21 per day per resident, which is as they say, pocket change. If only there were some mechanism by which drivers could pay in proportion to their use of transportation facilities, say, something proportional to how much fuel were consumed. Then maybe we could solve problems like this. The problem is governance. Roads should be re-conceived as a public utility, not a department of government. 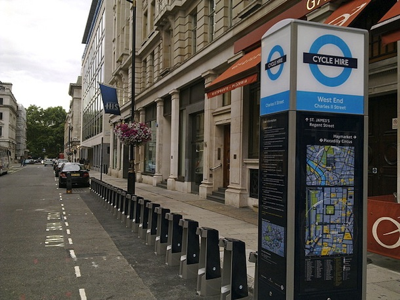 Will London’s New Wayfinding System Get More People Walking? The thinking behind the new system is to encourage more people to walk around London instead of driving or using already overcrowded public transport. By catching people at key decision points – such as tube stations – and providing them with the right information on walking times and local attractions, it is hoped that they will choose to walk. According to TfL, information really is key in achieving modal shift. Research found that most Londoners mental map of London is based on the tube map which is geographically distorted and can be very misleading. For instance there are over 100 connections on the underground where its quicker to walk than take the tube! Legible London maps will often show users that their destination is closer and more walkable than they think. Cities are more profound at night. Cities are more profound at night. Pictures of cities lit at night make them seem much more important places than those same cities in the light of day. At night, colors are muted, it is not quite black and white, but the garishness is avoided. Perhaps this is why I prefer London to New York, Black Cabs are just cooler than Yellow Taxis. new york city. from James Ogle on Vimeo. Why are we so afraid of terrorists? LOUISVILLE, Ky. — A couple in Kentucky said Wednesday that they want the Transportation Security Administration to change how it screens children after their 6-year-old daughter was frisked at the New Orleans airport. Selena Drexel told ABC television that the family was returning home from a vacation earlier this month when their daughter Anna was selected for a pat-down. Martin Macpherson, the director of the London-based Coalition to Stop the Use of Child Soldiers, said he is not aware of instances when terrorists have used children as young as six in an attack. Why are we so afraid of terrorists we succumb to this? 9/11 will not be successfully repeated, we continue to fight the last war. Access to Destinations is an interdisciplinary research and outreach effort coordinated by the Center for Transportation Studies at the University of Minnesota, with support from sponsors including the Minnesota Department of Transportation, Hennepin County, the Metropolitan Council, and the McKnight Foundation. The Access to Destinations Study takes a new approach to understanding how people use the transportation system, and how transportation and land use interact. At the heart of this approach is the concept of accessibility: the ability of people to reach the destinations that they need to visit in order to meet their needs. By focusing on accessibility – rather than simple congestion measures – the Access to Destinations Study aims to produce a more complete and meaningful picture of transportation and its role in our lives. This presentation will discuss the research and results of this five year study, along with a newly created online mapping tool to help those who make transportation and land-use decisions in the Twin Cities region capture variations in accessibility to different types of destinations for travelers who drive, bike, walk, or use transit. To learn more about accessibility and its role in the Access to Destinations Study, visit www.cts.umn.edu/access-study. Should there be a National Transit System? 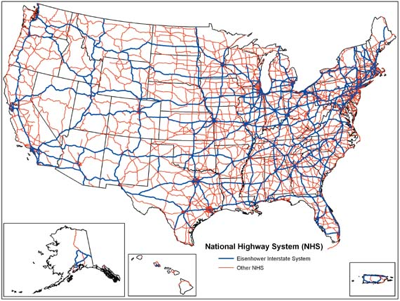 There is a National Highway System in the US, which identifies priority roads for federal investment. The NHS includes approximately 160,000 miles of roadway— principally the interstate highway system—as well as other roads that are important to the nation’s economy, defense, and mobility. Should there be a similar National Transit System? The American Public Transportation Association has advocated in its strategic plan to “Work to define elements of a national transit system that complement the existing national highway system, including those elements of public transportation systems that are of national and regional significance.”, but otherwise there seems to be no national policy discussion of this. President-elect Kennedy supported a $100 million mass transportation loan program proposed by New Jersey Senator Harrison Williams. This eventually passed as a $50 million loan, and $25 million demonstration-grants (not for long-term capital improvements), as well as a small planning program, but Danielson (p.158) writes “While loans might be more palatable to Congress, Budget officials pointed out that they would offer little incentive to communities which had reached their debt limit or which could float municipal tax-exempt bonds at a lower interest rate than federal loans. They also emphasized that the only criteria in the Williams bill for setting the magnitude of federal financial participation had been how much Congress might be persuaded to accept.” Loans were nevertheless endorsed by the urban coalition of metropolitan areas and the private railroads. Authorization was subsequently cut from $75 million to $42.5 million by the House, which was less sensitive to urban issues at the time than the Senate. Mass transit was then housed in the Housing and Home Finance Agency (later the Department of Housing and Urban Development). This positioning of transit and housing together is echoed today by the Obama Administration’s Livability Initiatives cutting across DOT and HUD. The concern of locating mass transit within the Department of Commerce was the influence of the Bureau of Public Roads. In 1964, a $375 million urban transportation program was passed and signed by President Johnson. However this program took the form of grants rather than loans, which were by their very nature more favored by states and metropolitan areas. In the post-Interstate era, there has been less new construction, highway expansion has slowed. More federal funds go to transit (about 25 percent of federal surface transportation capital funds go to transit), and the match requirement for states has increased. Metropolitan areas are not generally connected by urban public transit in the US, though they are connected by Amtrak and by the Aviation sector (which is certainly mass transit, if not public transit), both of which are already seen as national systems. There are other aspects. Highways are infrastructure, but not carriers. Transit services are carriers, and sometimes infrastructure and carriers. Occasionally the services are interstate (in multi-state metros), but none are really national. Nelson, J.C. (1959) Railroad transportation and public policy. The Brookings Institution.